It was only supposed to be a 30% chance of rain today. Yeah. Right. About 30% of me didn’t get rained on is more accurate. But it was a warm summer shower and not a downpour (after 7 AM, that is). Charley Gaylord and his son Brendan were coming down from Newburyport and were up for anything as was LD. We avoided the schooner fest area in Gloucester Harbor by going up the Annisquam to Essex Bay. It was almost deserted. The Captain decided we wouldn’t bounce around at Folly Point, so we dropped anchor in about 20 feet near the last exposed pieces of rock on the west wall. My first dive was mostly exploration because I hadn’t been here in several years. The big jumble of rocks wasn’t as steep as farther into the cove. The fish were very curious and I was able to attract several by just fussing with the downline in a rocky hole that had trapped it. In the course of freeing it, I whacked it against rocks and raised a cloud of dust that had fish around me in a cloud. Maybe the noise attracts them, so I set the camera down in a steady position and proceeded to tap the rock with a stone. Sure enough, they arrived for dinner like puppies. Some lined up and others shot in for a quick peek. All were cunners or perch. The water was in the mid 60’s and I wasn’t getting cold at all. For the second dive, LD recommended a large rock he’d discovered just a little ways further out to sea. Typical LD exploring just a little deeper/further/longer away from everyone else. The hunters were successful and so was the videographer, so I can confidently say that a good time was had by all. I can’t wait to do it again tomorrow. The weather was going to be perfect. We could probably have gone anywhere, but the consensus was to the “front yard” of the Lobster Pool Restaurant on the east side of Folly Cove for the first dive. The divers were Tom and Catie Childress, Jim Castelli, JK and Sandy Miller. We were joined by Pat and Patti Scalli on their boat, Mary Anna. Rafting up was a learning experience because of the passing boat traffic. Nevertheless, it was fun to have another Sisu to examine. 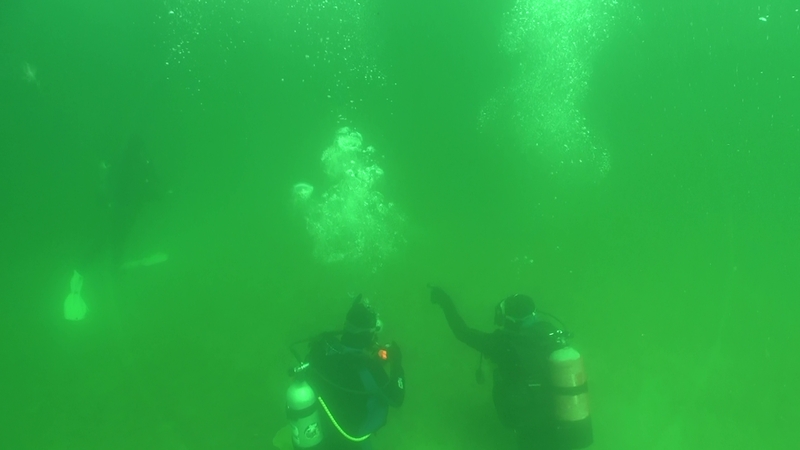 The divers reported so-so visibility and not as cold as yesterday water. I’d place that at 10 feet and low 60s. 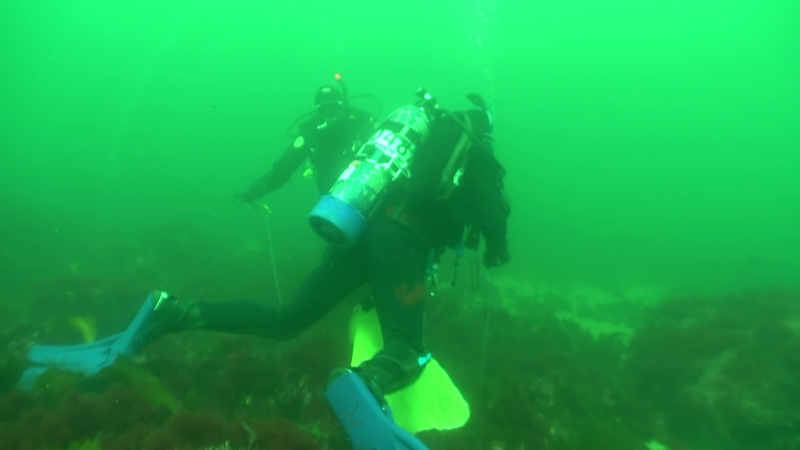 For the second site, we decided to use the deep water at Folly Cove’s point. It’s on the west wall, towards the open ocean. It gets to 70 feet it you head east from here, but the boulders and notches are beautiful if you go west, with the sun on your left shoulder. I found some cunner gathering in groups and it was fun to have them keep returning to examine my camera’s lens after they’d scattered when I exhaled. 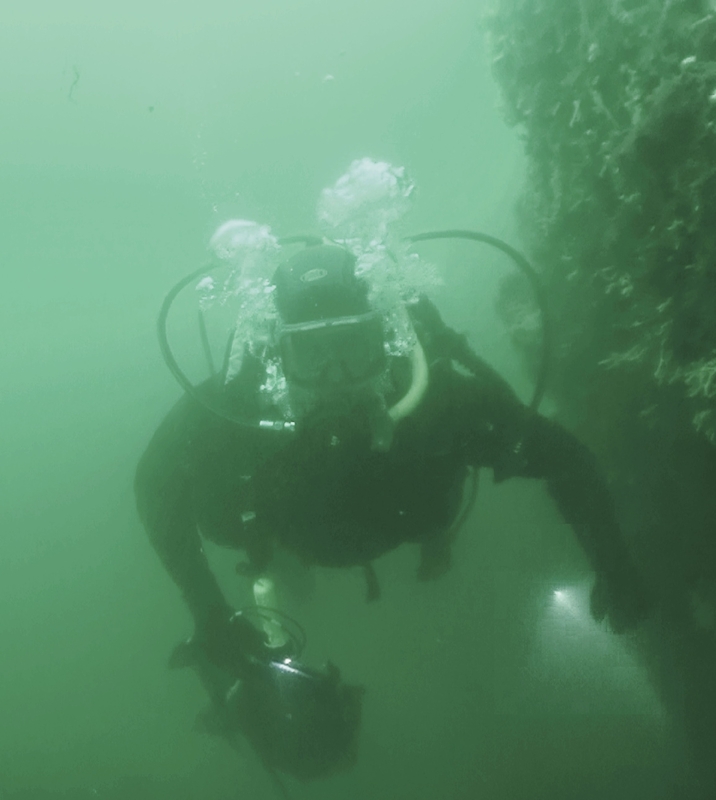 I put air into my drysuit as I followed some trenches and marveled at the sheer wall soaring above me some 30 feet. Because of the gloom and cold, I didn’t stay long down there. Our ride home was into the warm sun and I kept thinking, “How long will this weather hold?” Let’s hope until after next weekend’s three-day Labor Day holiday. Channel 5’s Harvey Leonard predicted that the weather would be perfect for this weekend. He nailed it. Thank goodness because we had a full boat with Tom and Catie Childress, Charley and Brendan Gaylord, Alan Hicks, and LD all cursing the steep ramp as we loaded up the boat. 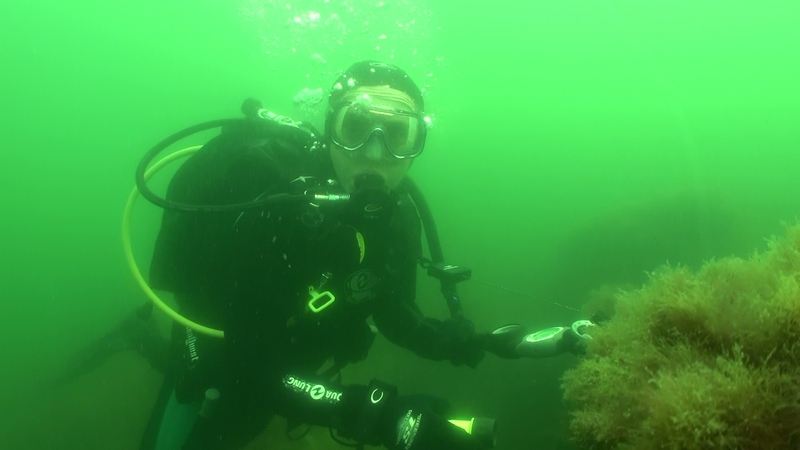 Because Catie was with us, we made the first dive off the southwest corner of Graves Island at the wreck of the USF New Hampshire, one of her favorite places, she said. She’s off to Lesley University in a few weeks, so she and her dad, Tom, were enjoying the last few moments of summer underwater. The divers found a too-big lobster, molten copper shards, curly nails and a mysterious roundish black object. It was too big to be a cannon ball and too light as well. For the second site, I chose the west side of Kettle Island in about 25 feet of water. Visibility here wasn’t very good (10-15 feet), but there were lots of lobsters everywhere. 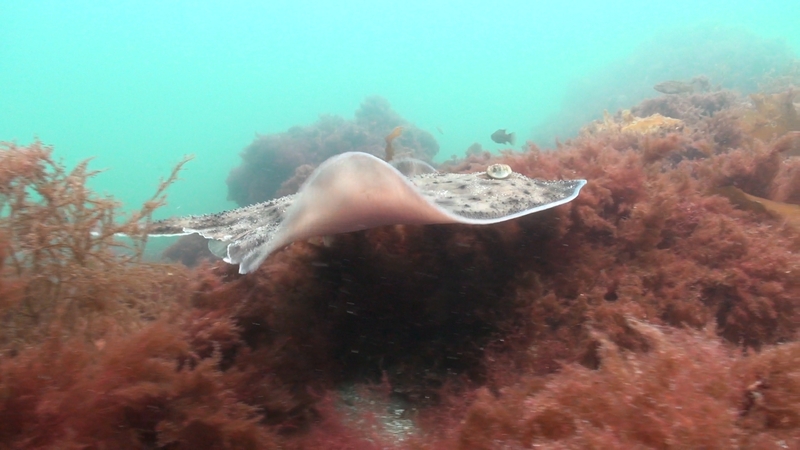 I saw a very big skate, but it saw me too and took off. We tore through the cookies that Tom and Catie donated and were happy to have them – both the people and the cookies, that is. As payment for the tough ramp as we loaded, the unloading one was f-l-a-t. We saw lots of cars and folk milling about during the final hours of the Bluefin Blowout at the Cape Ann Marina. Let’s hope it’s a success for them. Maybe this red stuff will hide me. He’s posing, don’t you think? Click on the picture and then click on it again and you’ll see that even his eye has stripes in it. We had a group that was up for the Rockport Breakwater today – Denis Foley and his son, Melandon, plus Jim Castelli. In fact, it was Jim who was the instigator, noting that it was flat calm everywhere and that we could make an easy trip to The Breakwater. Sounds good to us. We anchored near the top of the exposed granite block part. It was cloudy but not windy at all – just a gentle breeze from the southwest. The water was cloudy in the first 15 feet too, but the tide was going out and it got colder quickly as you descended the granite boulders. I stopped above the silt and looked up at the massive debris field of granite above me. It was in the low 50’s, according to Jim’s computer. But the visibilty was 20 feet or more. I saw lots of ghost traps and lines were everywhere. Some of the traps were very old and wooden. Others were a twisted mass of wire and rope. Trying to mimic the opening shot from last year’s video, I created a setup where I advanced on the camera in the clear, cold water and hoped I’d be in focus the whole way. Although we were in the same ocean, on the same wall, on the same day, I never saw anyone else. We powered around a regatta to the second dive site at Lanesville Shores. Here father and son were right in front of me, so I could video their descent. I trapped some bubbles on the lens, but I think the effect was successful. My tank only had 1200 pounds in it, so I cut the dive short to be sure I had enough air to get back to the boat if the tidal current had increased. It had and I did. I was bushed though. We were surprised to see Elizabeth Calhoun (Fred’s oldest daughter) and her husband, Michael Ahern, at the dock as we returned. Liz even helped me position the boat for a good landing. Then it was off for hamburgers at Mile Marker One. What a great end to the weekend! We had fun, fun, fun today. Linda and Kerry Hurd with their friend, Cindy, plus Kevin and Linsley Mordasky and Jim Castelli were ready for anything. The predicted northeast breeze aimed us south. 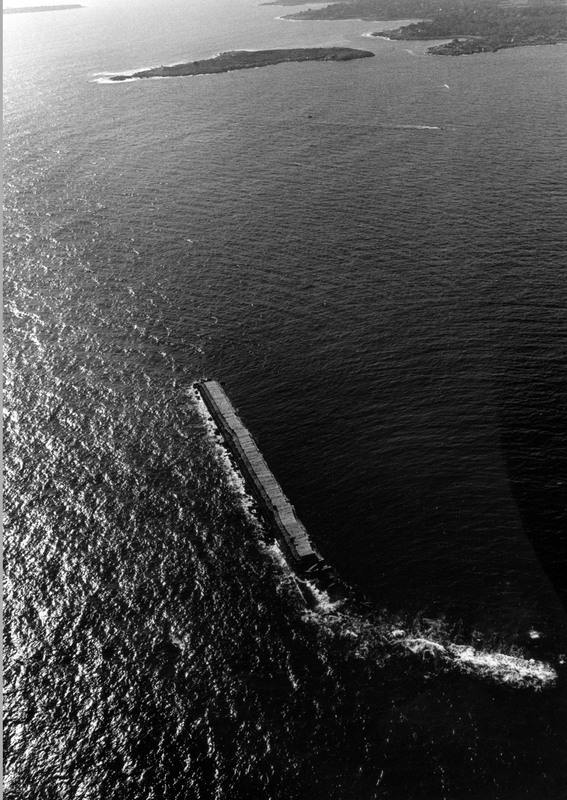 The wreck of the USF New Hampshire had Kerry’s blessing, so that’s where we headed. The water was ebbing and seemed colder today that usual. Kerry recorded 50 degrees and visibility of about 10 – 15 feet. He also ran into a juvenile black sea bass with aspirations for a movie career. Seems like this year they are more prevalent than ever before. As a refreshment, Linda’s pineapple chunk snacks were luscious. For the second dive, we chose the southwest corner of Kettle Island, because the wind had shifted to south east. It was calm and flat and an easy place to use my wetsuit for the last time this season. The cold stream gushing down my spine as I entered the water was enough to convince me that its time had come and gone. We saw many too-big lobsters and learned that striped bass had circled Cindy in the shallows. She noted that one had a heart-beat pattern instead of stripes on its side and it was the leader of the pack. Her veges and dip contribution to post-dive munchies was consumed by everyone and, surprise, we all had room for brownies. These guys are all a class act. I had to dig out my anorak this morning because it was 59 degrees for our drive around. The crispness of the day started with coffee and a corn muffin at Magnolia’s Grey Beach. We had Dennis, Bob, Pete’s students and Jim Castelli with us today. The predicted southwest wind didn’t materialize. It was from the northwest, so I aimed for the flagpole at the Atlantis Oceanside Inn for the first dive. Pete set the anchor in 26 feet and we started to notice the long, slow swells from the southeast. Nothing too bad, but it would make the water surge-y. They were successful and I could hear them commenting on their surface swim back to the boat about the too-big one that had surprised them by scooting away so quickly. Pete said the water temperature was a good five degrees warmer than it had been yesterday at Folly. For the second dive, we aimed west and I could smell the roses from the land as we anchored at Stone Garage. 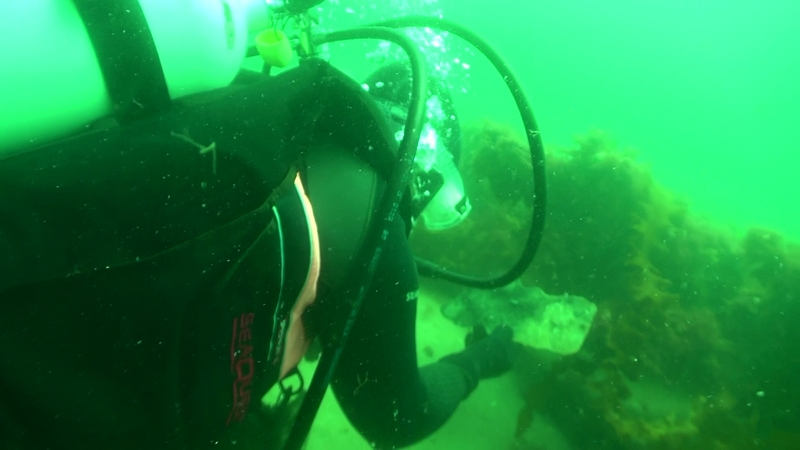 Here is where Pete and the students made their last training dive and they performed their weight belt ditch exercise to remind them how good it feels to drop the weight. There are now three new Dive Patrol scuba divers in the world. Congratulations to Andre, Anna, and Laurie! Visibility was so-so and there was surge again, according to Jim. But I relished the roses’ fragrance until the wind shifted (surprise) to the southwest. Now it was crisp and cool because it was from the ocean, not the land. We drove home into the sun and coolness. There were shimmering spots on the ocean surface where the ripples caught the sun and reflected it – a sure sign of a low sun in the west. I think we turned it today. The water in Folly Cove was COLD – in the low 60s on the bottom. It’s like I rounded an August weekend’s corner and Floop!, we’re on the slippery slope to fall. We had a full boat with beginners from Pauline at Diver Jim‘s in Belmont. Pete is their instructor. We also had Alex F. and his crew, some of whom were new divers. The west wall at Folly seemed the best place for this mixed bag of scubas. Everyone eventually got to the bottom of the downline and had a mask that sealed and a weight belt that fit. I went off with my camera to film whatever would stand still long enough for me to focus on it. In this case, it was another juvenile black sea bass. This one wasn’t as cooperative and photo-savy as the one LD shot last weekend. It was skittish and not sure whether it should pose or flee. Here Alex is urging Will (his future son-in-law) to lead the way. Will is the one with the angel white fins. We felt the visibility was very good at about 15-20 feet. The air was certainly warm enough in the low 80s sheltered from the northwesterly breeze. It was much colder than that out on Essex Bay on our way home. I docked the boat in a “reverse wind” with a little help from my friends. The ramp was flat for the homeward schlep of gear. It’s too early for it to be fall. Right? We had Linda Giles and Myanna plus Alex Shure with us today. We wanted beauty, calm and warm water, with no surge or floating red sea weed to obscure the hiding places of prey. Of course. No problem. Given the wind, we probably could have dived anywhere on the cape, but, after driving around to look, we decided Stone Garage and the Back Shore would offer the best conditions. 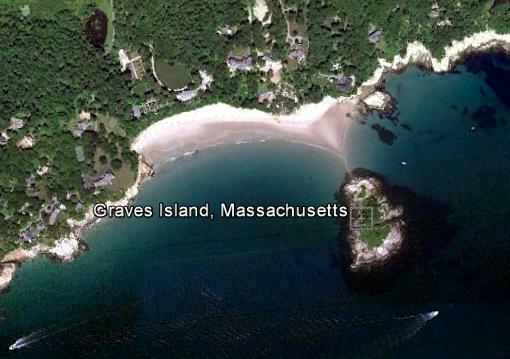 The first site was between Brace Cove and stoney Grapevine Road beach. We call it Stone Garage because we can see a former boat house (or rum-runners’ landing) carved out of the sold granite from the ocean. I anchor in about 25 feet of water right in front of it. 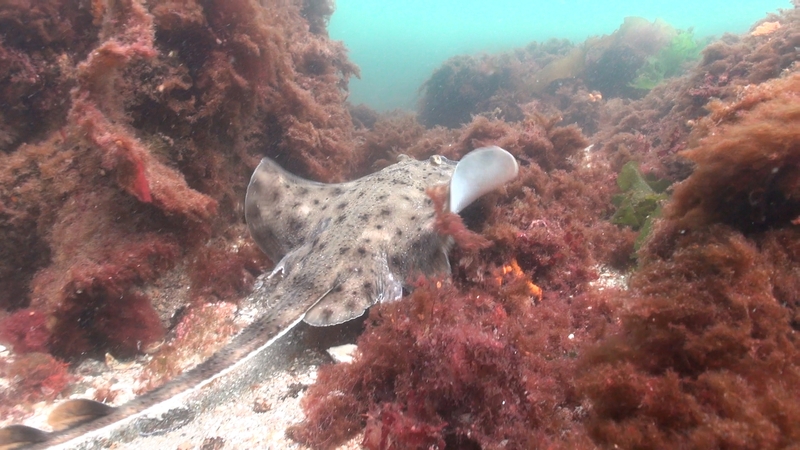 The reports were of good (but not great) visibility and warm enough water. The Captain and Alex were video-ing and macro photographing, respectively. Linda and Myanna found dinner, as did Pete. I watched the wind swing from northwest to southwest, as predicted by www.wunderground.com There wasn’t as much huge kelp at this place as there has been in the past. For the second site, I moved us around the point to the flagpole in front of the Atlantis Oceanfront Inn. See the flagpole in this picture? Well, I anchored just about where this picture was taken from, in about 25 feet of water. Happily, the big fellas hang out here. Linda and Myanna found a “too big to take” male with a “harem” of similarly sized females under the same boulder. I videoed one who was just chillin’ and his crusher claw was bigger than my hand. Unhappily, the water was much colder here although the visibility was much better (over 30 feet). 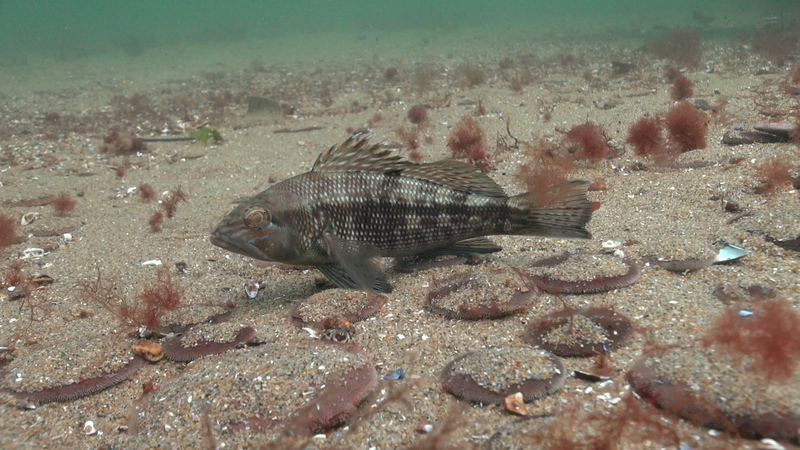 We didn’t stay as long, but I was thrilled to see two more juvenile black sea bass. Just like yesterday’s report from LD explained, these were posturing and posing in either a threat or a display mode. Who knows? I got three Oreo cookies for the ride home.